Urban living can be expensive, especially for families living in Vancouver, one of the world’s most expensive cities. Finding cost effective strategies can come out of necessity. To lessen one’s environmental impact can be an important personal choice. 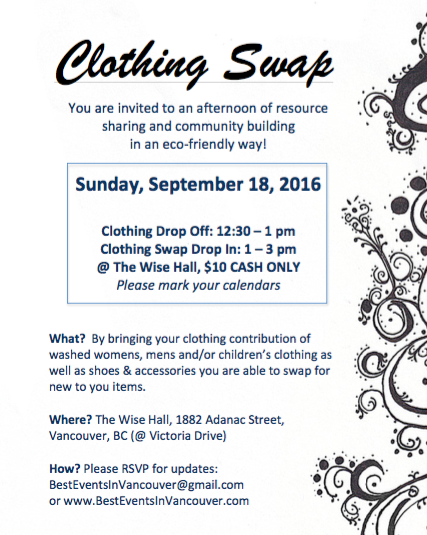 Community resource sharing, such as lending libraries, flea markets, thrift stores, and now clothing swaps, are only growing in popularity. Clothing swaps empower individuals by providing an affordable option for residents to clothe their families, fashionistas to update their wardrobes, and community members to have a social space to reconnect while they “shop”. Since 2012 BestEventsInVancouver.com has been facilitating resource sharing for a positive impact in communities by hosting a series of eco-friendly events including: clothing swaps, upcycling workshops, and community potlucks. Two recent clothing swap events hosted by BestEventsInVancouver.com have benefited over 200 participants and thousands of items of unclaimed clothing were donated to a local non-profit charity.